From the Editor: We are blessed to have some very talented people who have joined in this organization to improve opportunities, not only for themselves but for other people who are blind. Scott LaBarre is one such person. His talent has certainly been recognized by the National Federation of the Blind inasmuch as it has elected him repeatedly as the president of the National Federation of the Blind of Colorado. He also serves as the president of the National Association of Blind Lawyers and as the chairman of our Preauthorized Check Program. But he also distinguishes himself in the profession of law, operating his own legal practice and standing at the forefront of civil rights legislation for the blind. Thank you, Mr. President. I've just got to say that in Colorado we are so proud of Maureen Nietfeld [who spoke immediately before him]. She truly lives our philosophy. Let's hear it again for Maureen Nietfeld. [cheers]. In 1966 the United Nations General Assembly adopted the international covenant on civil and political rights. Article 19 paragraph 2 of that instrument holds that freedom of expression includes the right to information. Specifically it states that everyone shall have the right to the freedom of expression. This right shall include the freedom to seek, receive, and impart information and ideas of all kinds regardless of frontiers. A critical component in exercising this right is the right to read and otherwise manipulate the written word. For the blind, this right has been difficult to achieve, and its full realization and permanency are not yet secured. In addition to the traditional barriers limiting our right to read, namely the barriers of our inability physically to read the visually-printed word and the barrier of inaccessible information technology, there is another significant barrier to our full enjoyment of the right to access information, and it is copyright law. Our domestic exception, however, did not address the great dearth of accessible works throughout the world. It has been estimated that well over 95 percent of the world's works have not been available in accessible formats. Think about that for a moment. Unfortunately international copyright has either outright banned the practice of exchanging accessible works over international borders or has made it extremely difficult to do so. This has been a phenomenon, a phenomenon later dubbed "the book famine for the blind." That is why we engage with our partners in the World Blind Union to put forward an international agreement that would amend international copyright law proactively to permit exceptions and limitations allowing reproduction of works into accessible formats and to allow such accessible works to flow across international borders. Four years ago Dr. Fred Schroeder and I had the pleasure and deep honor to stand before you and report on the miracle that had occurred in Marrakesh, Morocco, on June 28, 2013. After several years of intense negotiations and at times stiff opposition, an international treaty had been born: a treaty holding out the promise to eradicate the book famine for the blind and signaling a global priority on the right to access information, the right to access knowledge and literacy for the world's blind and print disabled. So, what is going on with respect to implementing the Marrakesh Treaty to Facilitate Access to Published Works for Persons Who are Blind, Visually-Impaired, or Otherwise Print-Disabled? As we join together in this convention, the treaty has become an official, binding, legal instrument for all the countries that have ratified or acceded to it. The treaty fully entered into force when our neighbors to the north—Canada—delivered its accession to the World Intellectual Property Organization (WIPO) on June 30, 2016, becoming the twentieth so-called contracting party to the treaty. Since Canada, nine other nations have joined the Marrakesh Treaty community. The full list of countries, in chronological order of ratification or accession, is: India, El Salvador, The United Arab Emirates, Uruguay, Mali, Paraguay, Singapore, Argentina, Mexico, Mongolia, The Republic of Korea, Australia, Brazil, Peru, The Democratic People's Republic of Korea, Israel, Chile, Ecuador, Guatemala, Canada, St. Vincent and the Grenadines, Tunisia, Botswana, Sri Lanka, Liberia, Panama, Honduras, Kyrgyzstan, and Kenya. Now, you are all pretty sharp, and I'm sure that all of you have noticed that not present in that list of twenty-nine countries is the United States of America. How can this be? The United States has led the way in producing accessible titles, both at the governmental level with our National Library Service for the Blind and Physically Handicapped, and at the private level with organizations like Bookshare. We have one of the most robust exceptions to our copyright law permitting the creation of accessible formats. This Federation exercised its leadership and convinced the Obama administration to support a treaty, and the United States Government turned out to be a strong advocate for what later became the Marrakesh Treaty. The United States has, in fact, signed the treaty as of October 2, 2013, indicating its intent to ratify. And, as you know, our Constitution requires that our president send the treaty to the Senate for ratification, which requires a two-thirds vote, and President Obama did in fact submit the Marrakesh Treaty to the Senate in February of 2016. No Senator has voiced opposition to ratifying the Marrakesh Treaty, and in fact the vast majority has expressed support. Why, then, do we not find ourselves among the nations who have boarded the Marrakesh Express? It comes down to this: after President Obama forwarded the treaty to the Senate, along with proposed implementing legislation, key copyright stakeholders such as the publishers and the library community expressed reservations or insisted on amendments. For a time it felt like déjà vu all over again. Because we started relitigating the same issues: the very same issues that we had talked about ad nauseum in Marrakesh and in Geneva, the same issues to which we had found solutions, and the US key stakeholders had agreed to such solutions. 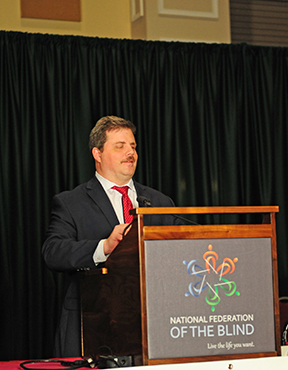 It will do so because of us—because of the National Federation of the Blind. But we must all encourage and urge the Congress to stop waiting around, to not be late to the station, and to get on the Marrakesh Express! On the global front, we are very active in the effort to increase the ratifications and implementation of Marrakesh. We are participating with the World Blind Union to accomplish this goal. I have the honor of serving as co-chair of the WBU's ratification campaign committee. And we are training blind advocates from all over the world on how best to get Marrakesh ratified in their countries. We have created a thorough and scholarly implementation guide that advocates and legislators can use to best implement Marrakesh. I also have the privilege of serving as WBU's representative on the board of the Accessible Books Consortium. ABC, which is an entity created by WIPO, serves the purpose of implementing Marrakesh on a practical level. It is a public-private alliance representing the key stakeholders in this area. Now there are many entities that serve on ABC's board, but just to give you a flavor: The International Publisher's Association, the International Federation of Libraries and Institutions, and the International Federation of Reproduction Rights Organizations all serve on ABC. And I want to thank the worldwide community of copyright stakeholders for their commitment to ending the book famine. ABC has three main objectives: number one is to operate the ABC Global Book Service. This is a platform where authorized entities can list and share their accessible titles and get them into the hands of blind and print-disabled individuals around the world. Thus far we have acquired over 400,000 accessible titles in ABC's database. 130,000 blind people from around the world have downloaded and are using these titles. As countries ratify and accede to Marrakesh, these numbers will dramatically increase because it will no longer be required to achieve the permission of the copyright holder to exchange these titles, so literally hundreds of thousands of works can start flowing across international borders. ABC's second major objective is capacity-building. ABC has been working in six different countries to increase the amount of accessible works, and these are countries that did not have authorized entities creating works. So far over 4,000 titles have been created in accessible format—mostly in the arena of education. And in many of these cases, this is the first time that the blind of those countries have ever had access to accessible works in their native language.